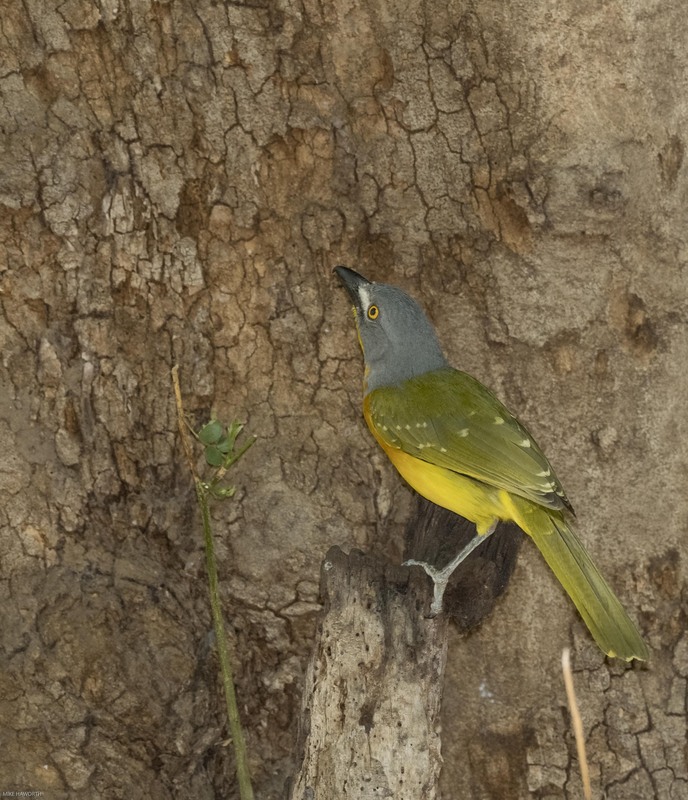 This the second post from my recent trip to Mashatu Game Reserve in south-east Botswana. The game drives through Mashatu provide exceptional wildlife sightings and opportunities to photograph wildlife. 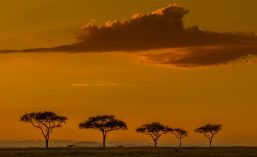 The game drives usually take place first thing in the morning from 5h30 to 9h30 and 16h00 to 19h30 in the evening in the summer. After each morning game drive we have a hearty brunch when everyone discusses the morning’s sightings. After brunch it is usually very hot so everyone either goes for a swim or a snooze. There is nothing better than a lunchtime sleep after a morning of fresh air and excitement. A few bird baths formed from natural rocks have been placed around the camps and these baths are regularly filled with water. This attracts many birds and small mammals into the camp, especially when the area is very dry and still waiting for its first good summer rains. Once everyone had retired to relax, the areas around the bird baths were quiet and undisturbed. 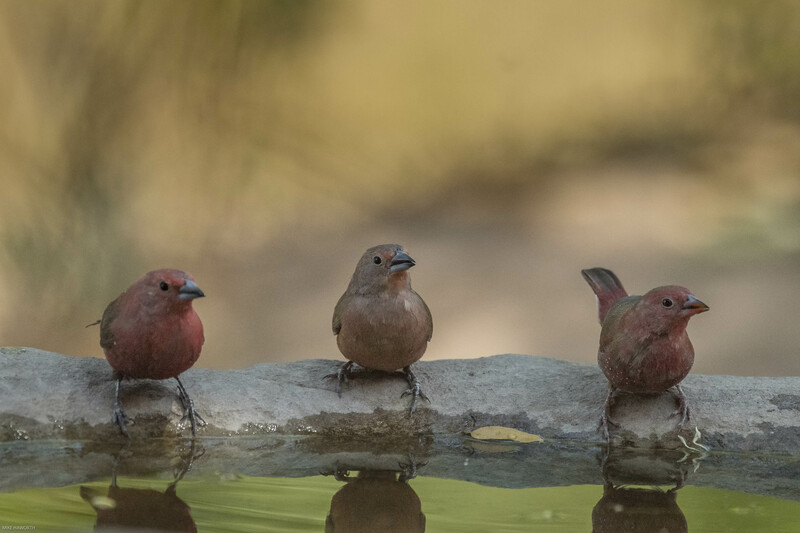 This is the time when the potential for bird bath photography starts and you need to be part of the quiet. I set up my camera with a 840mm focal length lens on a tripod and began my vigil knowing a key ingredient for success would be patience. Many of the birds call as they approach the area of the bird baths. 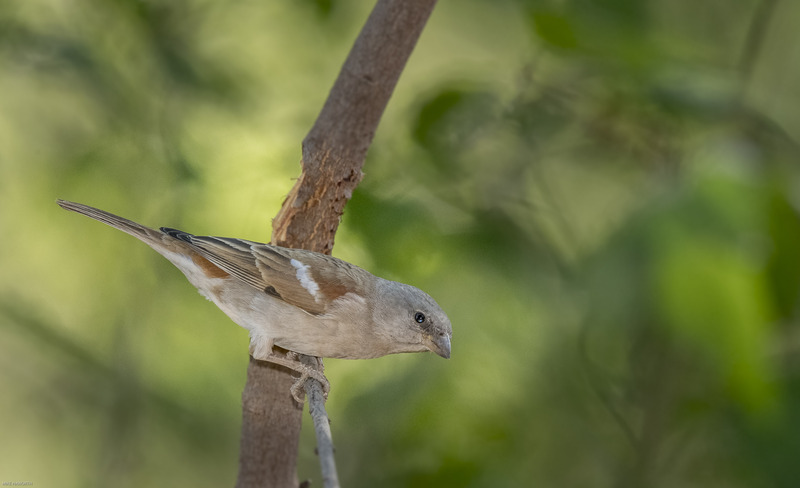 The white-helmeted shrikes chatter, the arrow-marked babblers babble and sparrows and waxbills twitter. 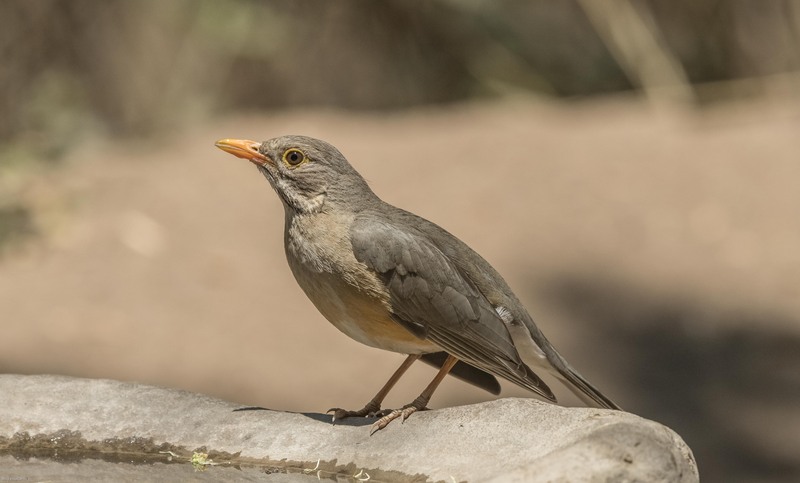 Most of the birds normally fly into a nearby shrub or tree just to see whether it is safe to come down to the bird bath. 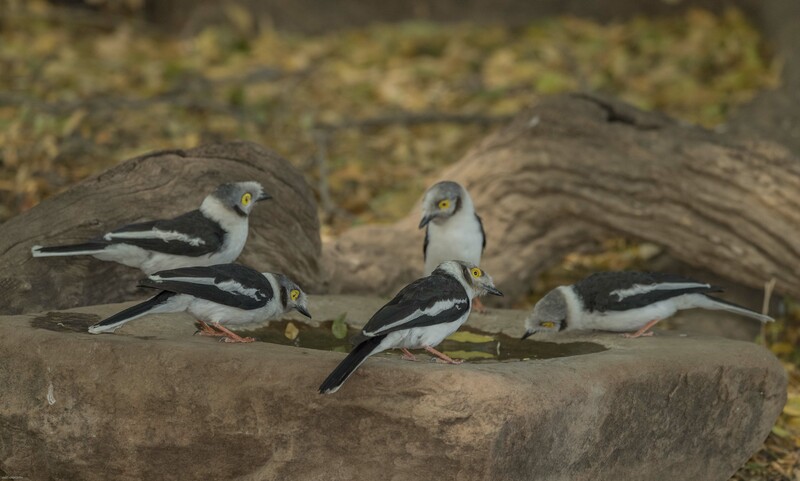 A family group of white helmetshrikes were frequent visitors to the bird bath in the six days we were in the camp. These birds are cooperative breeders with an alpha pair which bonds for life. 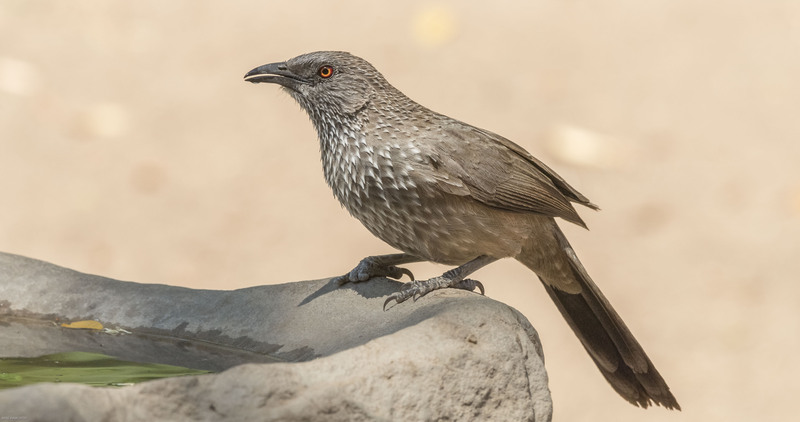 The Arrow-marked babblers also came in groups, they were very noisy and seemed to love to bathe in, as much as drink from the bird baths. This babbler’s name is derived from the downward pointing arrow marks on its throat, breast and belly plumage. A female Kurricane thrush, like her partner arrived very quietly. This means that you have to be attentive at all times as some of the birds arrive unannounced. 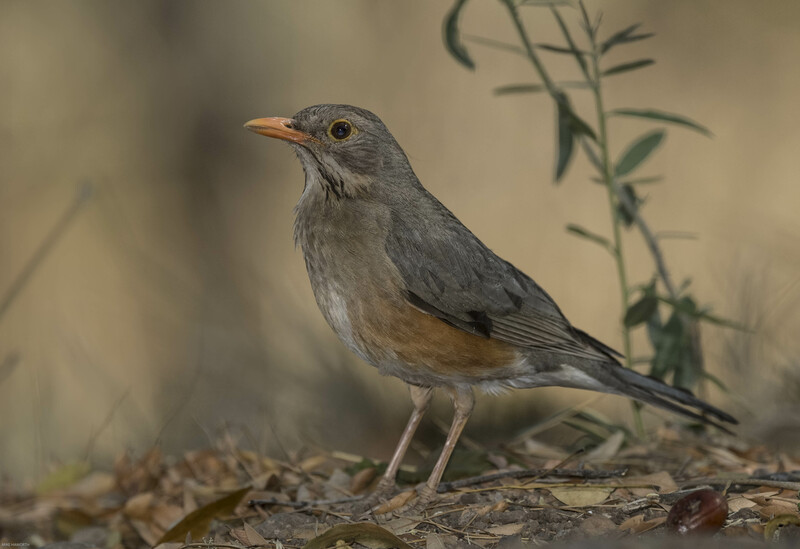 These thrushes prefer the woodland vegetation and avoid forest and grasslands. The Grey-headed sparrows always flew into the nearby branches with much twittering to check if it was safe to come down to drink. This sparrow has a diagnostic grey head and is larger than a waxbill and smaller than a weaver. 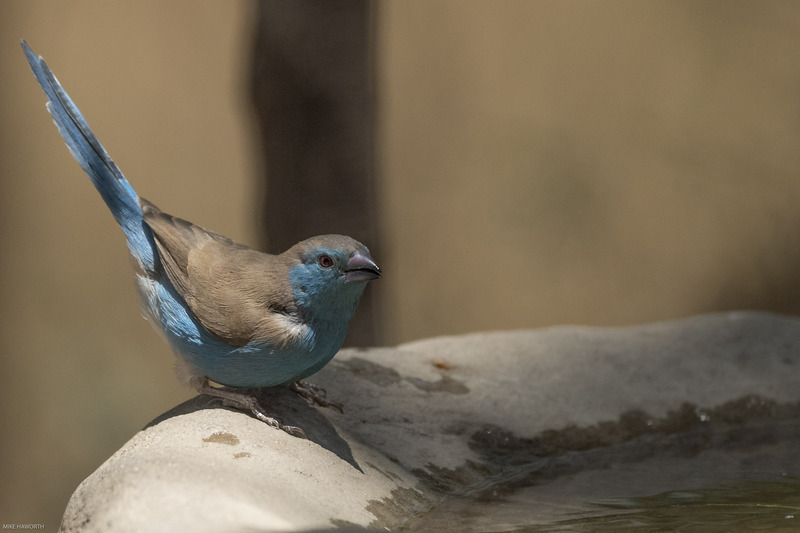 Blue waxbills, like the Grey-headed sparrows, were wary drinkers never just flew straight down to the bird bath. This waxbill has a beautiful powder blue face, breast, rump and flanks. A male Southern Masked weaver in full breeding plumage. He was quite an aggressive character. This weaver could be confused with a Village weaver but the Southern Masked weaver has a red eye and the Village weaver a yellow eye. The latter is a slightly larger weaver. 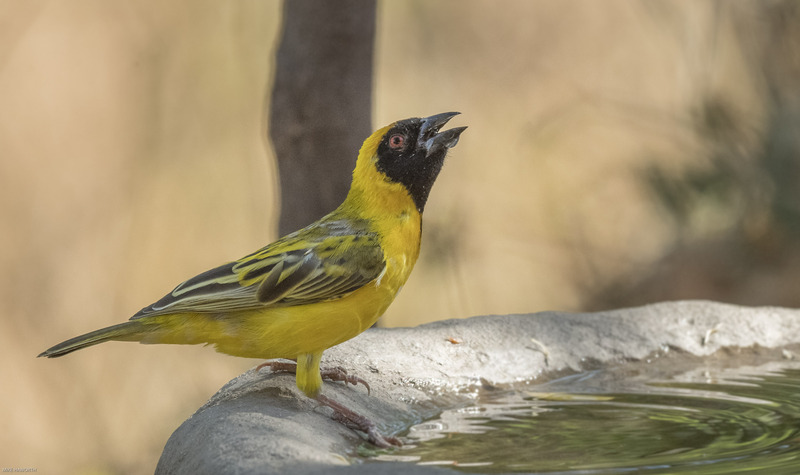 The Village weaver’s back is much more darkly speckled and its back face mask extends further down its throat than the Southern masked weaver. A White Helmet shrike looking for the rest of its flock. 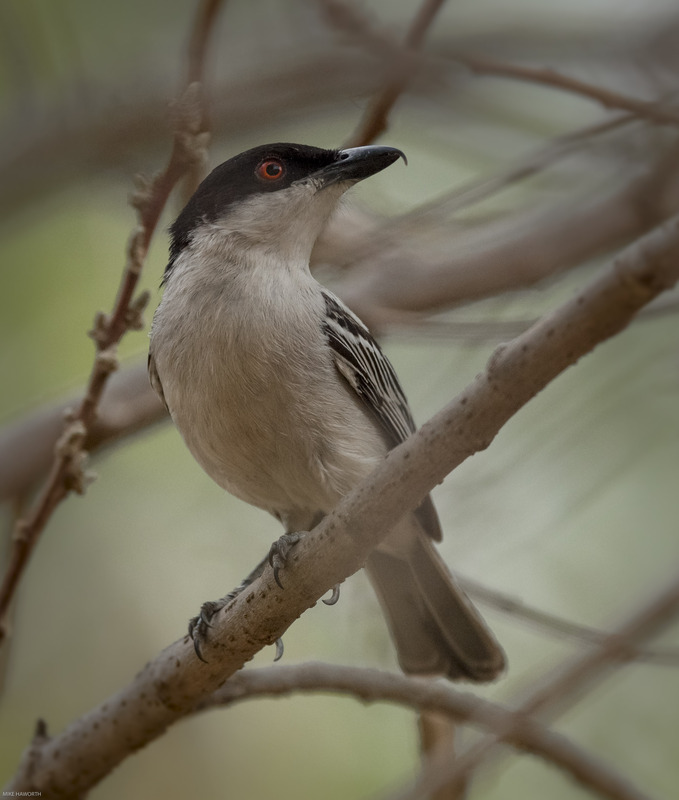 This Helmet shrike has a white crest which it raises when alarmed. 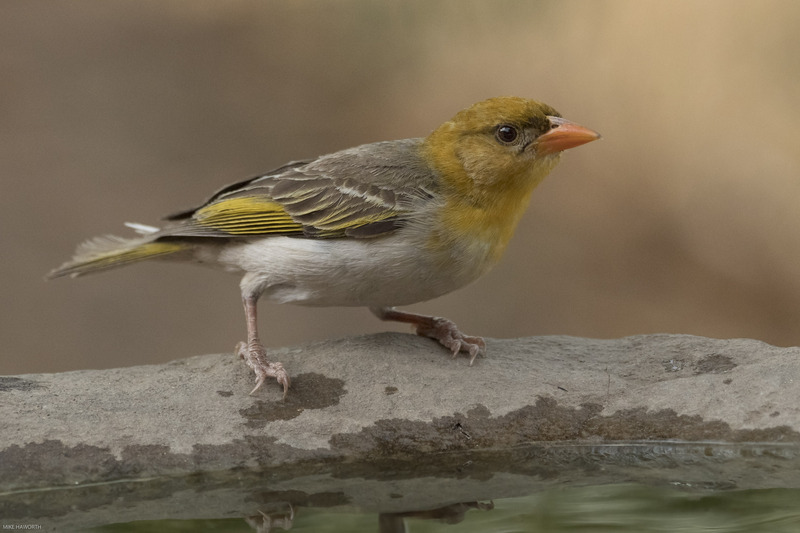 A female Southern Red-headed weaver. 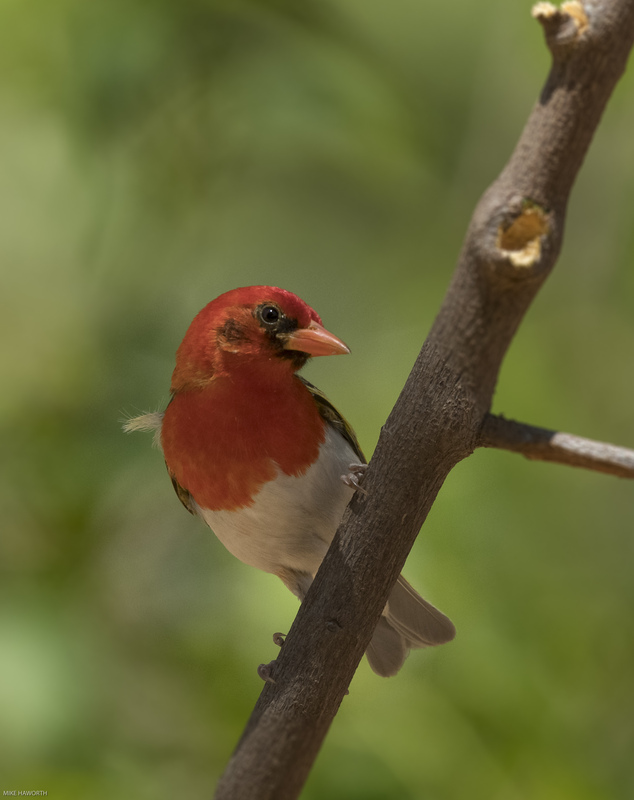 A male Southern Red-headed weaver in full breeding plumage. A Crested Barbet, colloquially called the marmalade bird because of its red and yellow colouring and its crest which is raised when excited or alarmed. A male Kurricane thrush wandering around in the brush next to the bird bath. 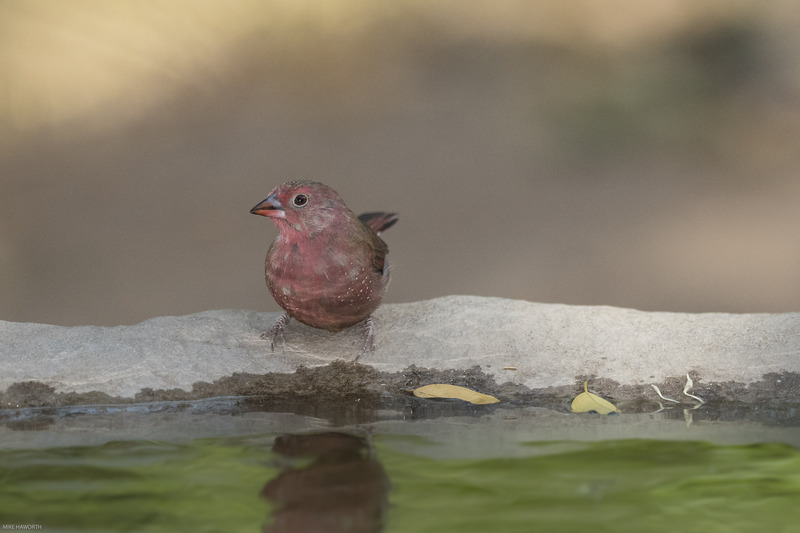 A Jameson’s Firefinch came down to drink in groups and individually. It can be identified by its pinkish-red colouring and blackish bill. It is a similar size to the Blue waxbill. 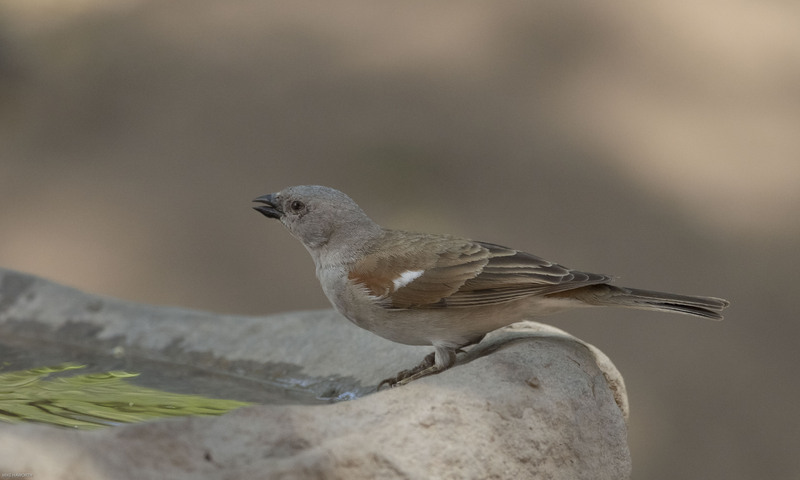 A grey-headed shrike came down to drink at the bird baths in the shade of a large Mashatu tree next to the patio of the camp. Its haunting piping whistled call could be heard throughout the day. This bird is unmistakable because of its colouring and cannot be confused with an other shrike. This is a large shrike quite capable of killing a Bloomslang, a venomous green tree snake which can grow up to two metres in length. 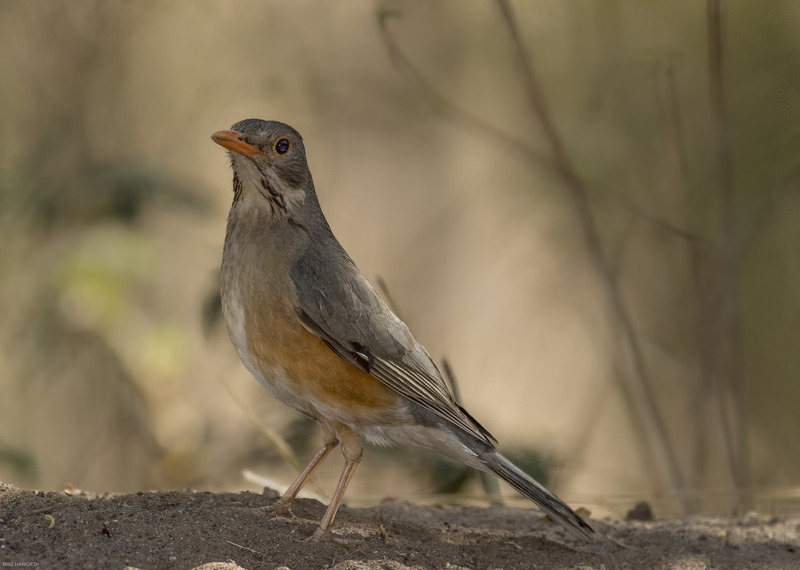 A male Kurricane thrush can be identified by its speckled throat and broad malar stripes and bright orange bill and orange sides to its breast. A female Paradise flycatcher flew around the bird bath without ever coming down to drink, when I was watching. These flycatchers seem to dance around in the trees and do not perch on a branch for any length of time making them tricky to photograph. 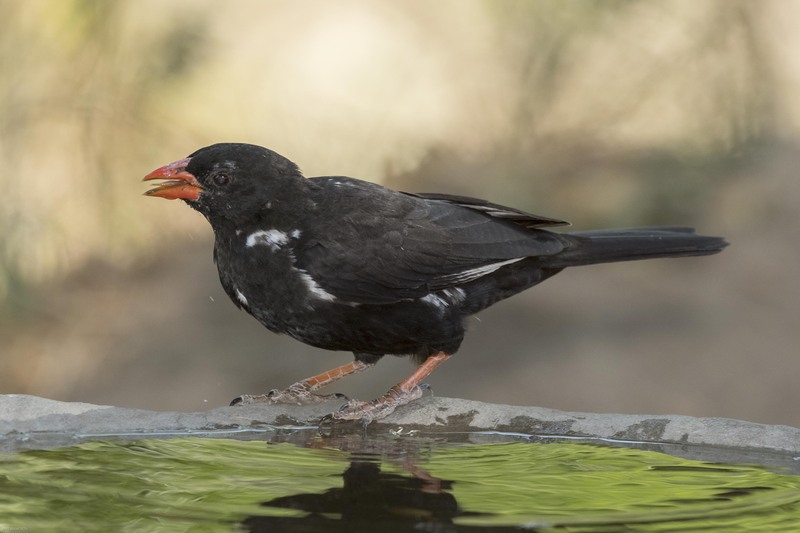 A male Red-billed Buffalo weaver having a drink. This is also an aggressive bird which does not tolerate smaller birds drinking next to it. These weavers breed in colonies and usually make their untidy nests on the west side of a thorn or Shepherd tree. 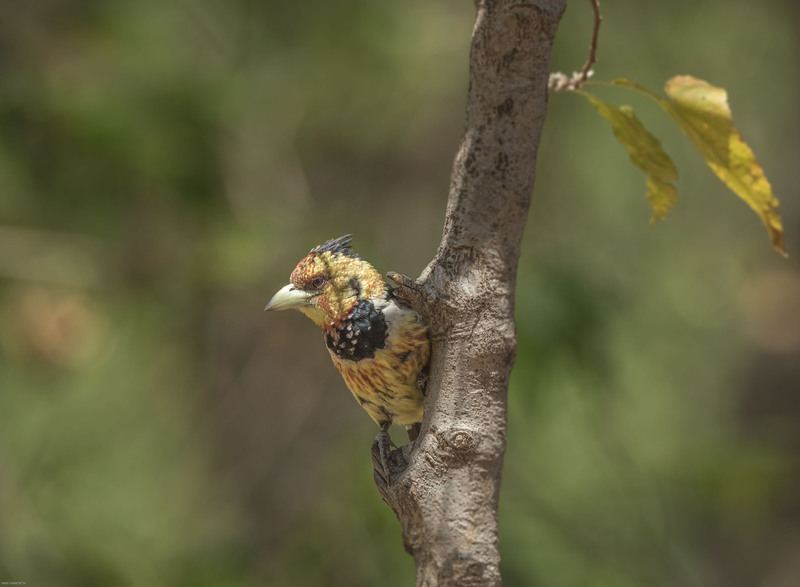 A Crested barbet sitting in a nearby sapling checking to see if the bird bath areas was safe. 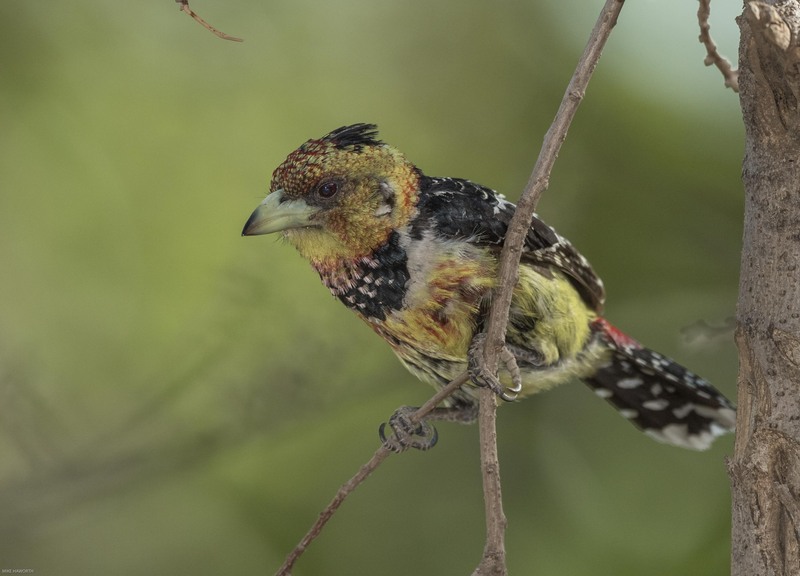 This barbet has a distinctive black collar dotted with white spots. 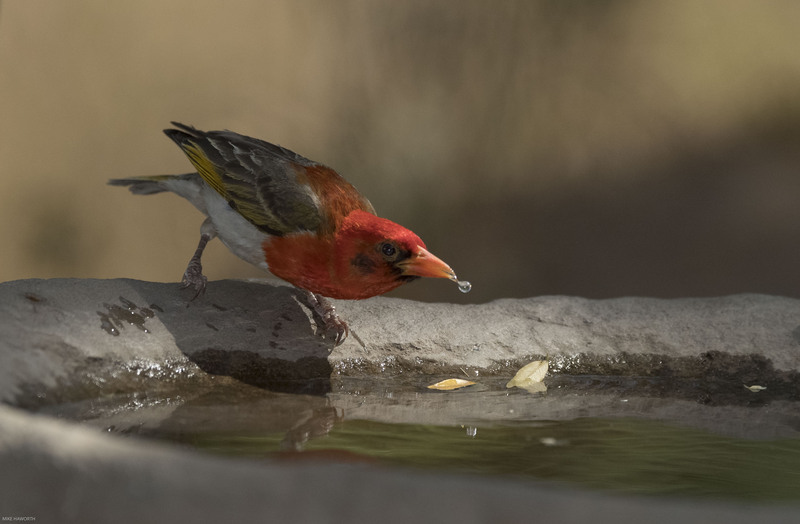 A male Southern red-headed weaver enjoying its drink of water in the hot part of the early afternoon. The dappled light around the bird bath was constantly changing dictating the use of a flash and single point exposure metering. A common but beautifully adorned Laughing dove walking on the sand next to the bird bath. 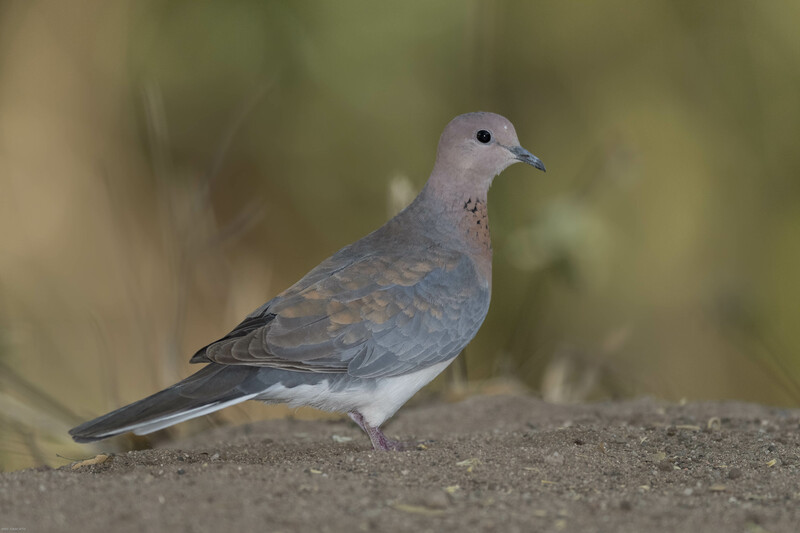 A flash helped to softly illuminate this subtly coloured dove. 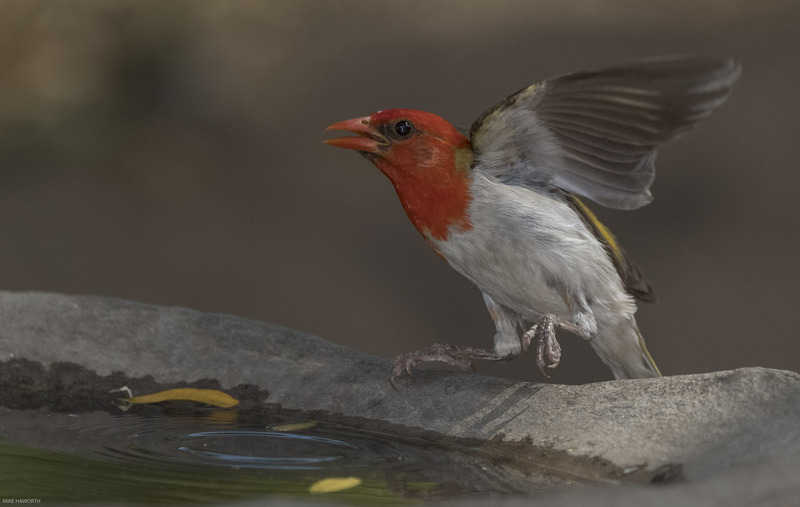 A male Southern red-billed weaver taking off after drinking his fill and showing its contrasting red head and white belly. 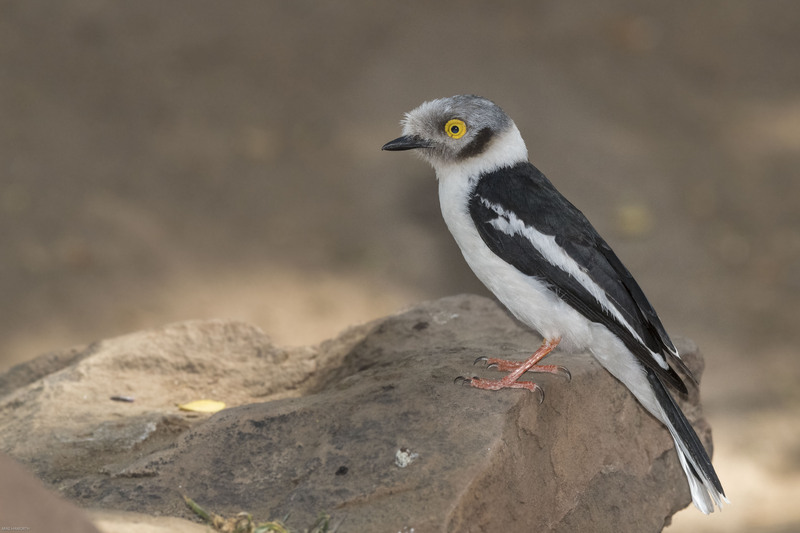 A White helmeted shrike with its striking yellow wattled eye ring. 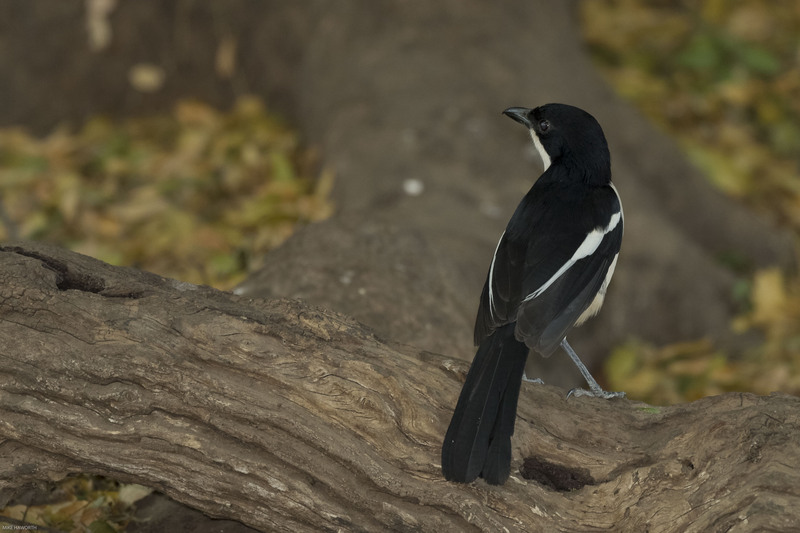 A Tropical boubou in the shade of the large Mashatu tree next to the camp patio. The male and female of this species are identical in colouring. This boubou is more often heard than seen. 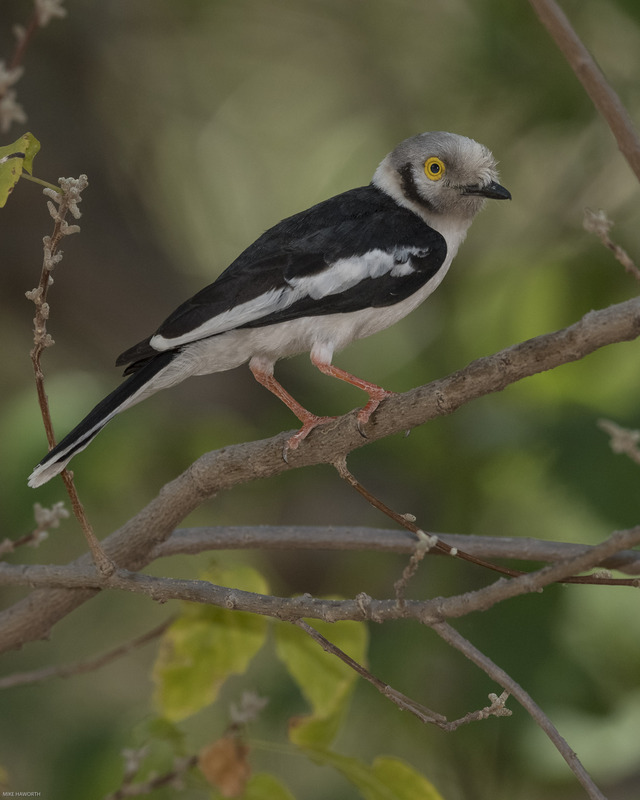 It has a wide repertoire and one of its calls could be mistaken for the Grey-headed shrike’s call. This bird has a voicebox called a syrinx not a larynx which enables it to sing in two voices at the same time. 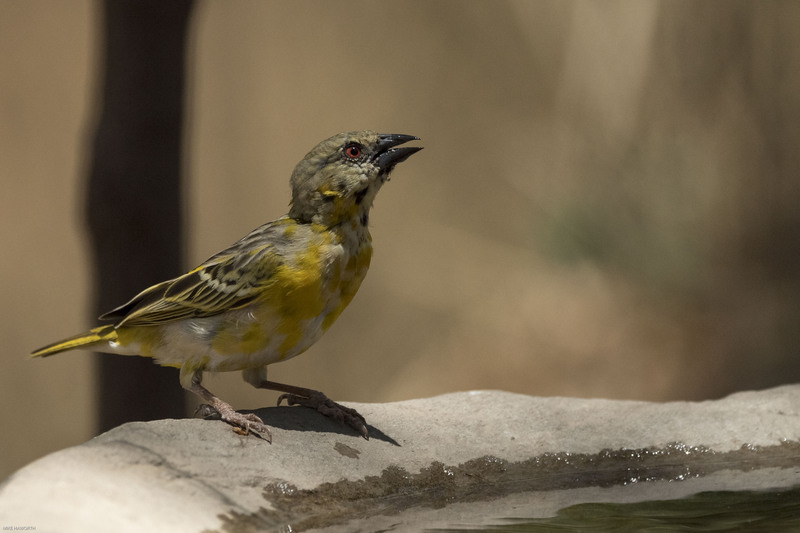 A male Red-billed weaver enjoying its morning drink of water. The female has the same red-bill but a brown plumage. 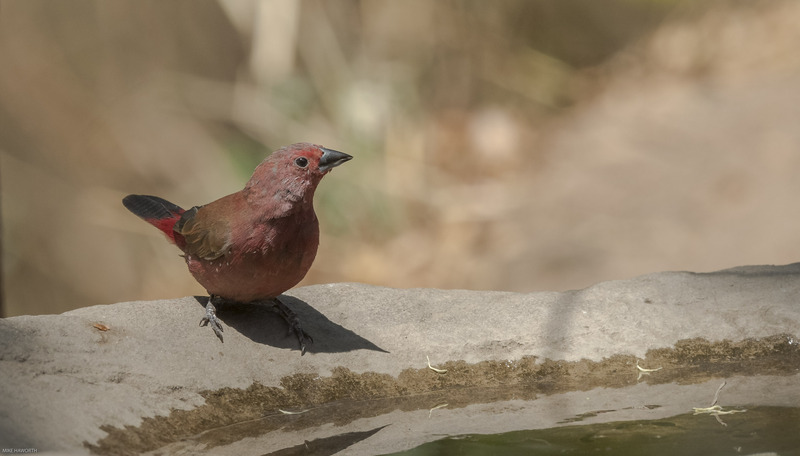 A male Jameson’s firefinch on the left of its female flanked on the right hand side by a Red-billed firefinch. The male on the right had side has a blue top mandible and red lower mandible and does not have the same all over pink breast. 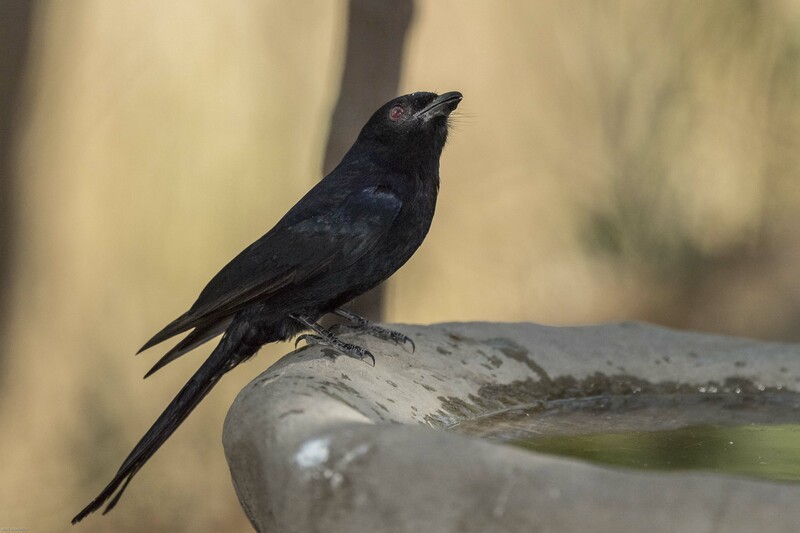 A Fork-tailed Drongo came down for a drink, they are usually alone. These birds are amazing mimics so you can be deceived by its call. This Natal spurfowl came very quietly to drink next to the large Mashatu tree in the shade. The Natal spurfowl has a red bill with a yellow base, its eye is black and it has heavy dark barring on its breast feathers. 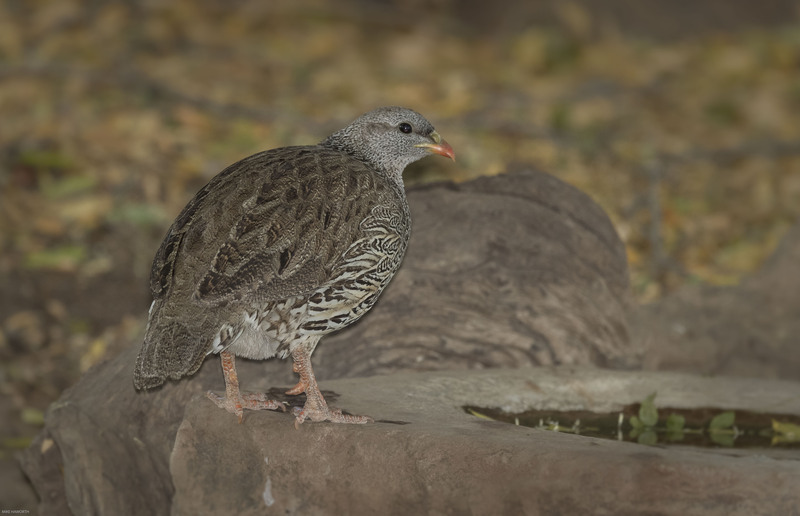 The distribution area in which it is found does not overlap between the Natal spurfowl and Red-billed spurfowl. The Red-billed spurfowl is usually not found in the centre of Southern Africa and it has a yellow eye ring and pure red bill. 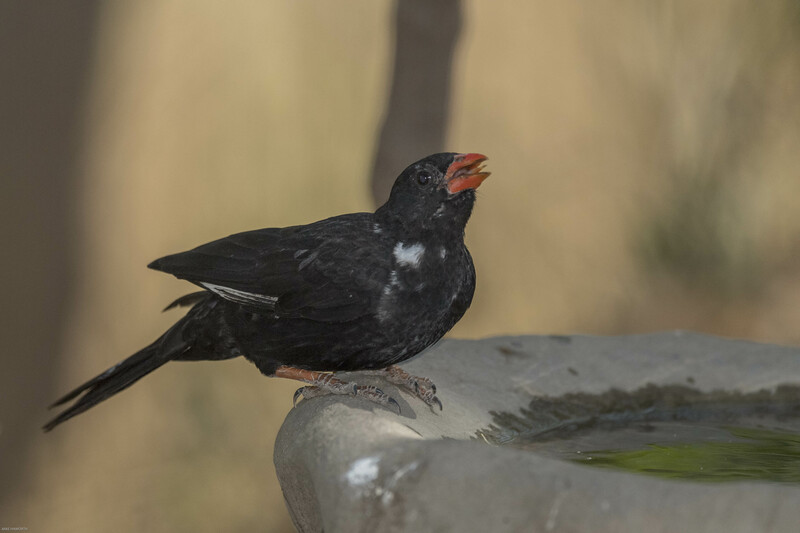 A thirsty lone male Red-billed firefinch differentiated from the Jameson’s firefinch by its different coloured mandibles with the lower mandible being pinkish red. 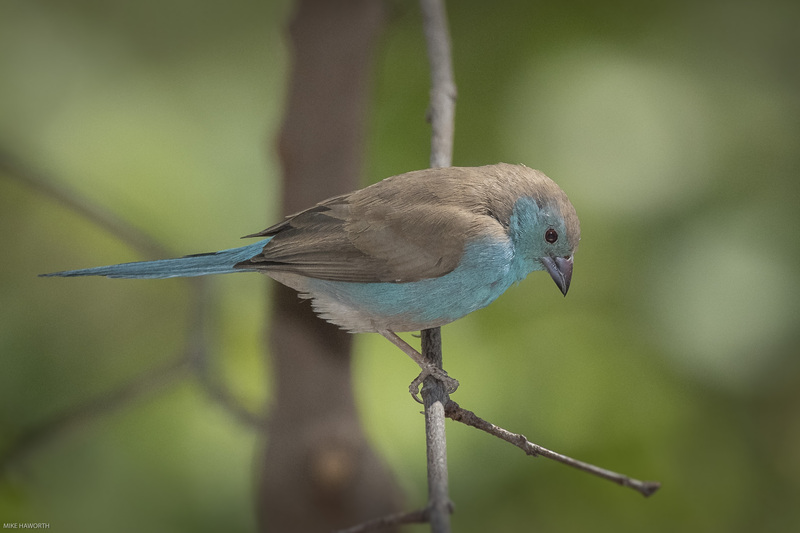 A Blue waxbill. You have to be quick to get a shot of this small seedeater as it comes in for a quick “in and out” drink. 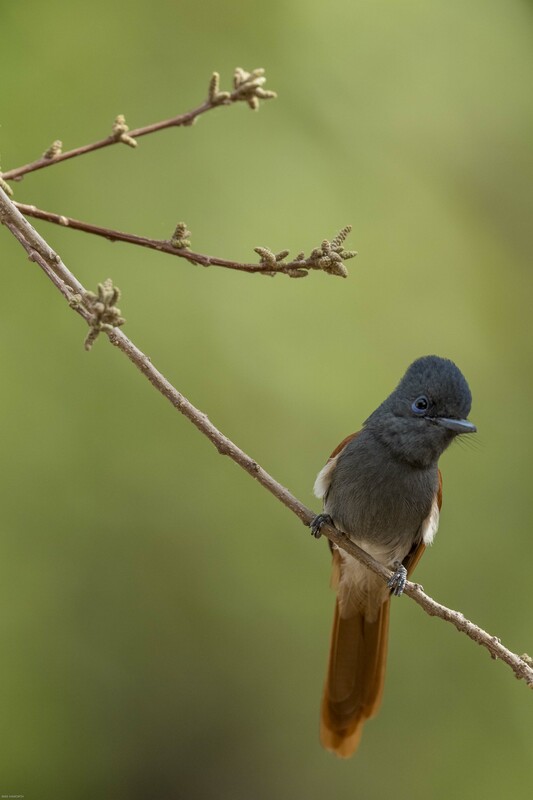 A female Paradise flycatcher- a brief furtive visitor. A juvenile Southern masked weaver developing his adult yellow breeding plumage. 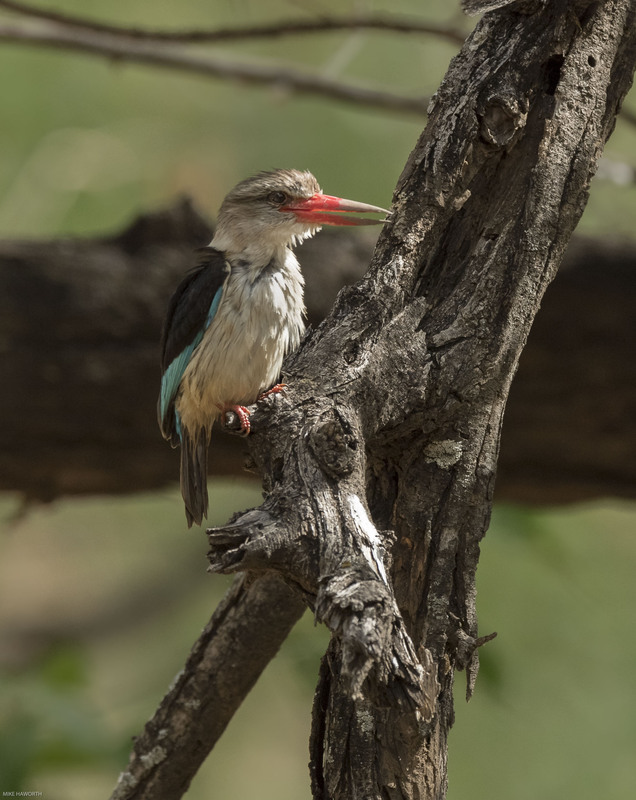 A Brown-hooded kingfisher having just had a bath. A male Puff-backed shrike with its black and white plumage and bright red-eye. When excited the male puffs up its back feathers hence the name. The female has a white forehead and eyebrow. 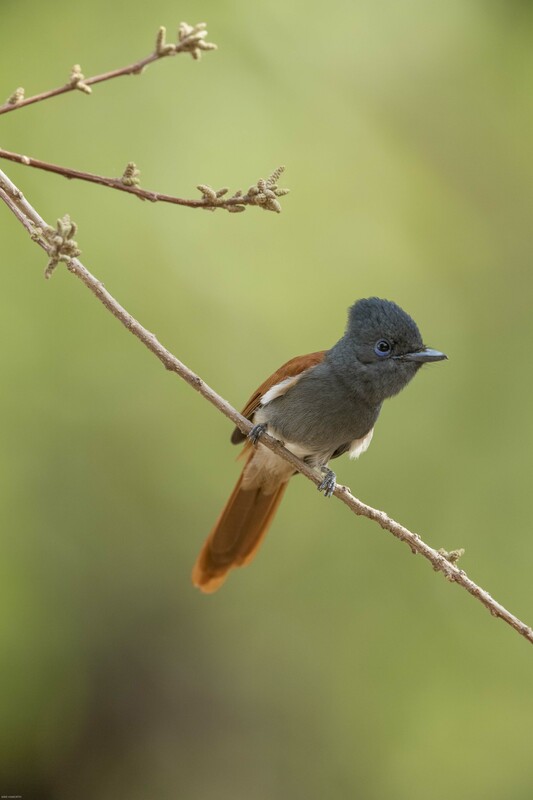 The beautiful but shyly obliging female Paradise flycatcher. I got shots of the male with his long tail but in the close up images, I cut off his long tail feathers. There is a meditation in being quiet and alone for an extended period just sitting, watching and listening to all the bird life around. Although not quiet there is something very soothing about all the bird activity around you. I saw many more birds than I photographed and could not get a decent shot of Hammerkops, various woodpeckers, Grey louries and more. 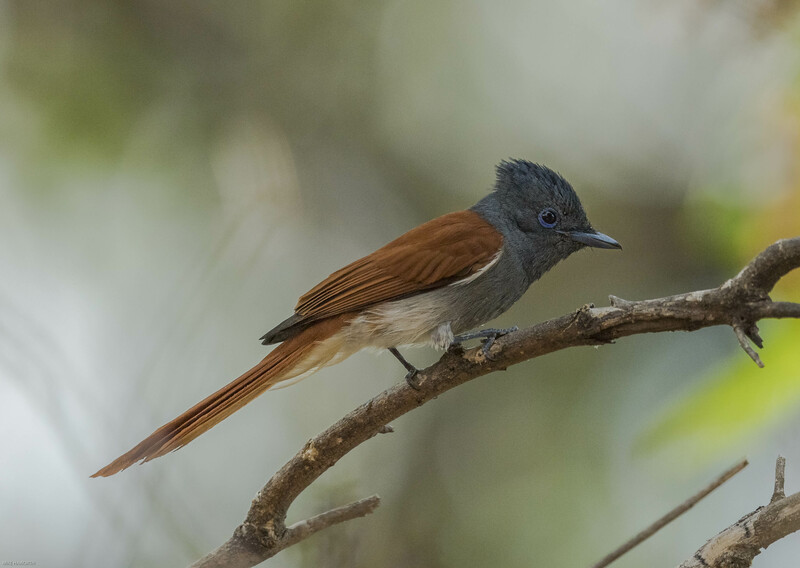 Even though 11h30 to 15h30 was a snoozy time of the day, there were times during that period when the paradise flycatcher or grey-headed shrike came to visit which was thrilling. Interesting commentary accompanied by beautiful photographs – I have thoroughly enjoyed this. Amazing variety of colours! I was particularly taken with the blue waxbill, such a gorgeous shade of blue.